At the 2013 Festival of Education at Wellington, one of the most startling and memorable talks was given by Sam Leith on Reclaiming Rhetoric. I rushed up to Sam afterwards and told him how inspiring I found his talk. I went out and bought his book, and I’ve read it twice since. 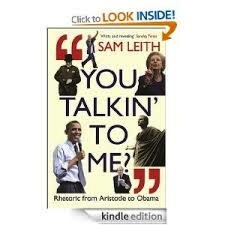 Exploring the world of oratory, from Aristotle and Cicero to Lincoln and Obama, is fascinating. I’m increasingly convinced that teaching rhetoric as a powerful body of knowledge can transform the English curriculum.